With their ‘feet up in the clouds’, Foster the People kick us with a totally different album that’s not as good as you hoped for but certainly not as bad as you expected! Their trademark sound is indie pop accompanied by euphoric melodies and lyrics, synths and distorted guitars. After the incredible success achieved by their debut album, Mark, Fink and Pontius present us with an altogether very different album, much darker if you may, and much more wittingly doomed to be an underdog than “Torches”. Mark Foster, the vocalist, has said that this record still has some joyfulness to it, but it won’t have anything to do with ‘Torches’. For him, his work in Supermodel is more precious, and he doesn’t want to be labeled as commercial once again. So, if you were expecting an album with tunes as catchy as Pumped Up Kicks or Don’t Stop, you will definitely only get a glance of it in the track “Coming of Age”, because the whole album is written and composed from another perspective and the band’s aims are likewise different. 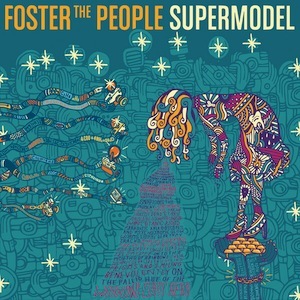 So, based on this idea, we can notice the slightly different changes from Torches to Supermodel. There’s still their overflowing hype, but the sound differs a lot from their previous work in many ways, and after listening to the whole album I do think this attempt to change their reputation has been considerately successful. I don’t agree that this album is somewhat worse than Torches as some critics have reacted, or either that it represents a much darker project since you do get a good feeling out of tunes like “Pseudologia Fantastica” and “Nevermind” as well as “Best Friend” which has a really cool vibe, with a very uplifting sound. They’re once again getting it right in their own special way. The vibe I got the most out of this album and some of the songs was a certain proximity to the swirly guitar loops you get from Tame Impala in some of their songs, and it’s funny that it’s not the first band that I’ve heard that’s been kind of getting into the same vibe as them. However, I do think they didn’t accomplish quite anything with the song “A Beginner’s Guide to Destroying the Moon”, it just sets off to an entirely opposite level and it kind of destroys the consistency of the album. The album represents a statement, a different vision and it’s very inspiring also to see that bands with so much attention and fans as Foster The People can still feel free to do things their own way. I appreciate the fact that they’re respecting their own vibe and not following someone else’s lead; that’s what indie music is all about.